kartik kannan's space on the web: Mandira Bedi on the Star Cricket"Dream Job!" Mandira Bedi on the Star Cricket"Dream Job!" Cricket and Bollywood are two prime passions for most Indians. Mandira Bedi is one lucky girl, who got to live both. For six years, this actress anchored Sony's pre-match cricket show, Extraaa Innings. While she infuriated the connoisseurs, she succeeded in attracting the female audience to cricket. Now, Mandira will continue her tryst with cricket as a judge on ESPN-Star's reality show Dream Job, a talent hunt for Sports presenters. Mandira speaks on her Dream Job, Cricket and more in an exclusive chat with Mayur Lookhar. You're one of the jury members of ESPN-Star's Dream Job. How has the experience been? We've just auditioned for three weeks. We've covered Mumbai, Delhi and Bangalore. In the coming days, we'll be going to Kolkata. So far, it's been a great experience. What has really caught my eyes is that in these three weeks, we've had at least ten women contestants in each city. Do you take the credit for inspiring these women to be part of cricket? I deserve no credit. It's their love and passion for the game that has brought them here. I was pretty impressed by one housewife, who came dressed as one. We didn't expect much from her but to our surprise she impressed all. What is it that you are looking in a contestant? Spontaneity and confidence. You get just 30 seconds to prove yourself. Thus, it's in those thirty seconds that you can either get nervous and throw your chances or make the most of it. Within this period, you should be able to think on your feet. Any particular contestant that caught your eye? There was one 23-year-old guy from Mumbai. Tough to recollect his name. He's progressed to the next round. He did a real good job. He also entertained by imitating Ravi Shastri and Harsha Bhogale. I expect him to go all the way. There was also a 61-year-old preacher who did well. For over five years, you were associated with Sony. Were you surprised when ESPN approached you? In the past, certain ESPN-Star guys were critical of your work on Extraaa Innings. Now you're working with these men. Your say on that. I'm fine with it. You can't please everyone. However, I'm glad that I've been able to change their mind. If earlier they criticised me, they praise my work now. You must have met the commentary team of ESPN-Star. What's your take on them? Actually, I haven't but I'm quite impressed with their set-up. The likes of Gavaskar, Shastri, Wilkins are all pioneers in cricket commentary. Ian Chappell has filled the void left by Geoffrey Boycott. I'm looking forward to meeting him . He'll join us (Dream Job ) from October. Who should be the Indian coach?Presently, we are doing well without one. However, if a coach is to be selected, then it has to be a foreigner. (Although the Graham Ford episode is fresh in our minds) I felt that Dav Whatmore would have been a good choice but he failed to make the cut. The veteran Indian cricketers will soon kiss the game goodbye. Do you think that we have the bench strength to replace these guys? That's our main concern now. No doubt, these men will be hard to replace. I guess, the Twenty20 World Cup will really show us how good our younger players are. What's your take on women's cricket in India? The merger with BCCI has indeed yielded financial benefits but women's cricket is still not popular with the masses. Sadly, cricket is still a male-dominated sport. On my part, I always make it a point to visit one of their matches. You have been replaced by Mona Singh on Extraa shots. Does that upset you? Extraa Shots went off air two years ago and I only did it for eight months. I don't think I've been replaced by Mona. I've worked with them for over five years and as such share a great relationship with them. It was wonderful experience for me. There was no break-up of ties; we parted ways in an amicable manner. Did your decision to join Dream Job result in this partition? The moment I received an offer from ESPN, I called Sony and briefed them about it. They were pretty cool with it. My contract with them was over and since they didn't have any cricket to show, I was given the leeway to do Dream Job. Finally, is your association with ESPN-Star limited to Dream Job itself? What's next for you then? Well, I hope I continue my association with ESPN-Star post Dream Job as I want to stick to cricket. I stil havent heard from ESPN regarding the next stage results. But after some googling and a few adverts on Television, I see that Star Cricket is all set to air the Dream Job Auditions from the 20th of September, every Thursday. Another advert said that 21st Sep, 8 pm would also be the time. I need to probably download the schedules from the site and then confirm. 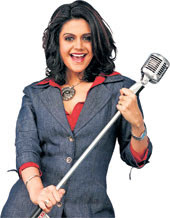 Mandira's career seems to have panned out very well, from the shy blushing girl of DDLJ, to the confident woman of SHANTI the mid 90's soap on DD, to hosing reality shows.I personally liked her wicked role in Kyunki Saas Bhi Kaabhi Bahu Thi, where she plays a possesed lover,even after knowing that the relationship may not be given a formal name. That possesed love approach to love and life, couldnt have been better exemplified by Mani Ratnam, when he casted Shahrukh in the lead. There are times when one waits like a 4 year old kid, eyes always on the postbox..and the times are no different now. I dont wait at the postbox, but every call and email that comes, there is a pregnant silence, whether this could be the "dream job selection mail". I remember waiting like that, to get my first 2 job offers when a few HR's decided to take their own time to send me the appointment order in 2004.I ultimately rejected Polaris and ended taking up Infy, but the experience of waiting for the both the appointment letter was a long wait. She's hot! Pity someone else is playing her banjo! And like true celebrity she spawns controversies. Reaching out to People via Commentary! Greek, Latin and a Million Dreams!